The Glass Art Guild regularly schedules national instructors as well as talented local instructors. These classes are offered at a discount to our members prior to being opened to the general public. Achieve the fine detail in glass that you have dreamed of, with ease and control when drawing images, textures and marks in the white glass layer by using the granular spray and sgraffito methods. Then learn to add depth and color to these drawings by painting with Watercolor Enamels, layering and highlighting with a scribe. Participants will get plenty of time to practice while creating small Panels, an original Wall piece, and their choice of Pendant, brooch and/or Earrings. See also our member taught classes. The Glass Art Guild of Utah will be hosting ceramic and glass artist Shelley Long (https://www.shelleysbrushworks.com), as participants explore the use of Colors for Earth paints while creating a seven layer Winter Rivers Scene. 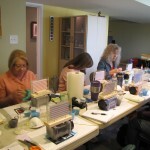 The class will be held at the studio of artist Kathy Watt in West Jordan, UT (just outside of Salt Lake City). The class is open to both members and non-members; limited space available. Contact the Guild for availability and additional information. About Shelley: Shelley Long loves to paint and to teach others to paint, hoping that they will find the same joy in it as she does! She developed her deep love for painting at a very early age. Her family owned several traditional ceramic shops, as well as a plaster mold company in the metro Denver area for 40 years, giving her a broad range of experience with several different mediums, from earthenware & porcelain clays to plaster & hydro-cal. Growing up in the shop casting molds, cleaning greenware, hand-building, sculpting & mold making were all a part of here every day childhood, however, sitting at the table during painting classes and seminars, soaking up information and painting along with the students was by far her favorite way to spend the day. Tapping in to the previous generation’s wealth of knowledge, learning from her own mother and many other talented teachers, some from as far as Germany, gave Shelley a broad range of techniques and perspectives. She began teaching ceramics and reproduction dolls in her shop in high school, and since then has been teaching in her own studio and others around the U.S.. Shelley continued her learning process to become a certified teacher for Doc Holliday Colors, Kimple (Creative Paradise), Colors For Earth and even Donna Dewberry bringing in new mediums like wood and paper. To this day she continues to take classes to broaden her own experiences so that she can pass it on to her students. 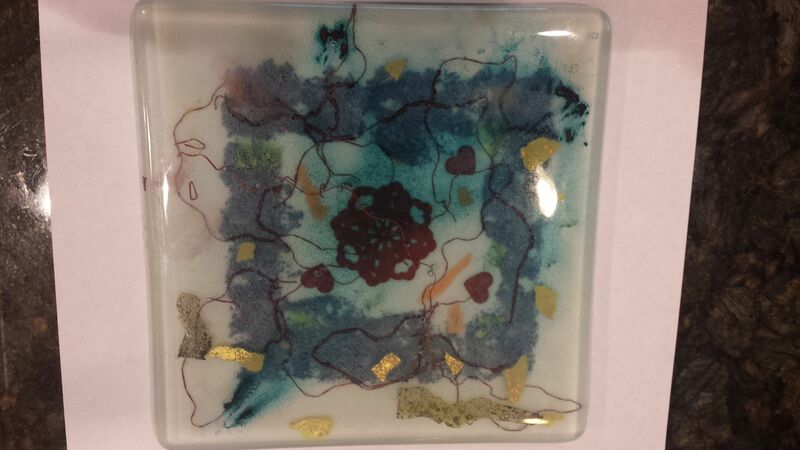 Her latest creative journey has been in working with fused glass. 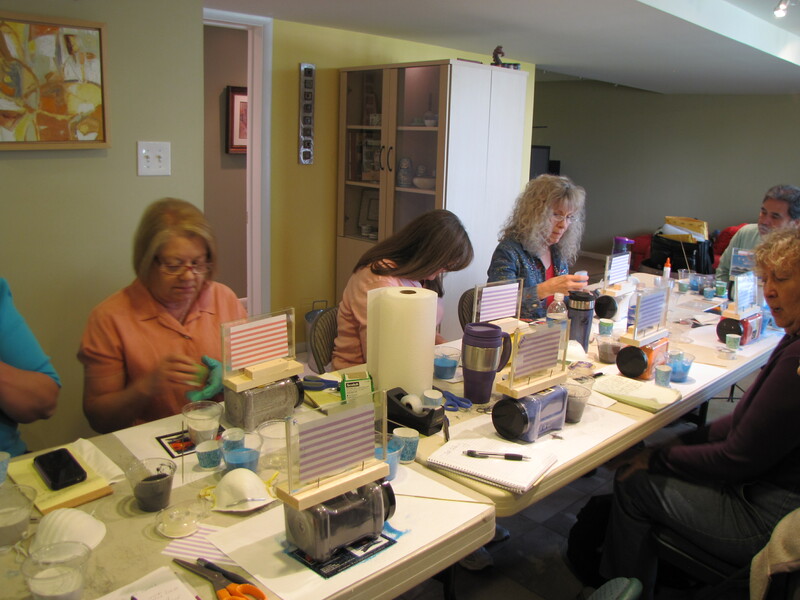 This fast paced workshop covered how to make a variety of different size, shape and style of kiln formed beads using Glass With a Past bead molds. 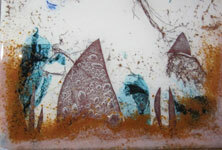 -This is class will used CoE90 art glass, stringers, powders and frits. Date: Saturday, May 16, from 9 a.m. to 3 p.m.
Lester Bird Lee, artist and teacher, resides in Logan Utah with his wife, three daughters and two sons. Lester was raised in a family of nine children in Mesquite, Nevada, where he was encouraged to be creative by his father at a young age. Lester received a BFA from USU and an MA in education from BYU and has now taught with Davis County Schools for twenty-four years. From his youth, Lester was largely self-taught in art, with an interest in being an accomplished watercolorist. Later he gained some of his color theory and art skills from such greats as Richard Bird and Anton Rasmussen. Though Lester is a high school teacher, fortune allows him to boost his income by selling his own fine art and illustrating for others on the side. Lester has shown his work at The Utah Arts Festival and the Park City Arts Festival and Art &amp;amp; Soup. He has won numerous awards for his art work and has sold hundreds of watercolor paintings and portrait prints locally, nationally and internationally, with some of his prints selling beyond one million copies. Lester has illustrated for Bookcraft Publishers, Publisher’s Press, Horizon Publishers, and exclusively with Bison Books out of New Jersey, as well as others. Perhaps Lester’s most noted illustrations are those on the cover and end sheets of the series The Work And The Glory by Gerald Lund. Lester is accomplished in most mediums of art, the most recent accomplishment being published as a bronze sculptor. Lester has served as Chairman of the Board and teacher at the Bountiful/Davis Art Center with whom he sells some art work, and has been represented by Philips Gallery of Salt Lake City. Most recently, Lester has been awarded the 2006 Huntsman Award of Excellence in Education award, and has been recipient of the Utah Art Education Association as High School Art Teacher of the Year for 2000. Lester has also designed and painted theater scenery for many theater companies, including Rodger’s Memorial Theatre and City Repertory Company. Quails on a Rock $149 for GAGU members in good standing. Public $199 . Must have basic cutting experience. JAG donates $10/student to GAGU. 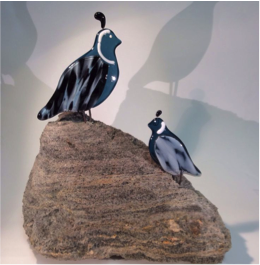 You will create 2 quails with an attached heavy gage wire embedded in the glass and mounted in a feather light rock. The short second day is to epoxy mount the quails. Refreshments provided during short break. Equipment needed: safety glasses, glass cutter and breaking pliers, closed toe shoes. 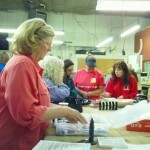 Wayne Jacobsen will be teaching a class on Glass Stripping 102 for GAGU members. This class will make 2 objects that will not require cold working. You will be required to fuse and slump the final shape in your kiln. What will make this class special is that each attendee will receive one of Wayne’s prototype Strip-It Rite tool for making precise and consistent strips of glass. Don’t do much stripping? Strip-It Rite will replace the T-Bar and hand cutter you currently use. Everyone will be required to bring 2 waffle squares to glass in addition to running pliers. 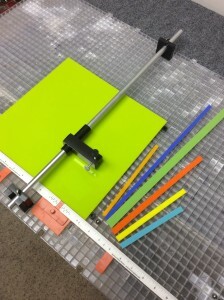 The Strip-It Rite tool works with the waffle grid system. If you do not have a Morton system, Wayne can sell you 2 waffle squares for an extra $20. The cost of the class will be $225, glass provided. Those who plan to take the class can sign onto the GAGU Facebook page and indicate a preference for the 4 hour class to be on Saturday, October 4 or Sunday, October 5 (Say 11-3). Glass Artists of Utah are offering an exciting new class taught by Jack Bowman of Spectrum Glass. the two and one/half day class will be on May 17 and 18 with the last 1/2 day voted on by attendees. The $300.00 (for GAGU Members) and $400.00 for non-members) includes materials, lunch and snacks on both full days and you will walk away with a 9″ by 14″ by 1″ thick piece of glass Art. 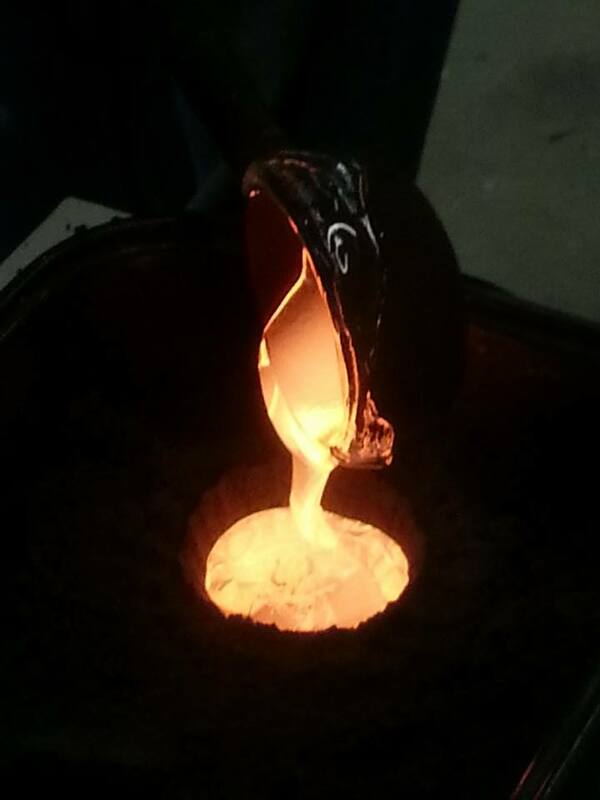 all fusing stages, temps and annealing. We had a full class of Guild members travel out to Stockton, UT on Saturday to attend Kaleen Knight’s Metal Clay and Glass class. 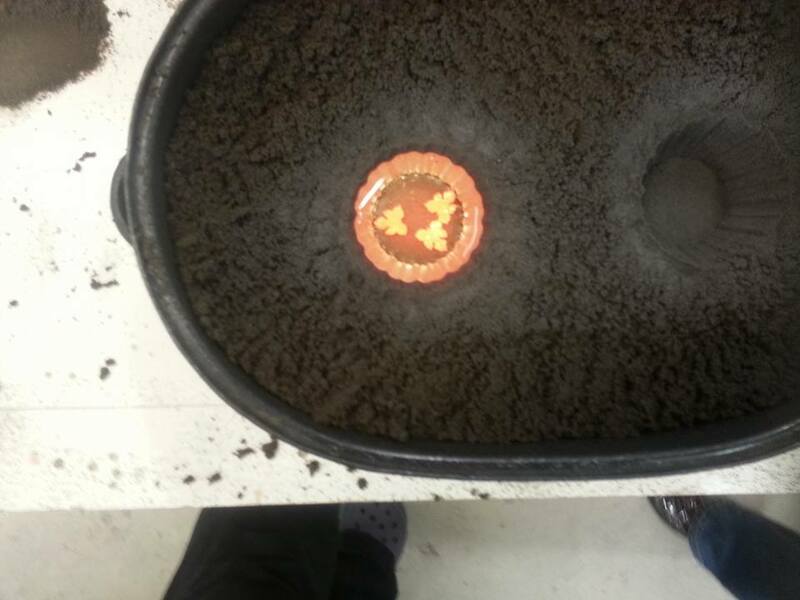 We each were able to complete several projects, including torch-firing fine silver components, setting glass cabochons in art clay silver (using any one or more of a variety of techniques that Kaleen demonstrated), and creating a silver inclusion pendant. Kaleen is an excellent instructor and was very patient with all of us. 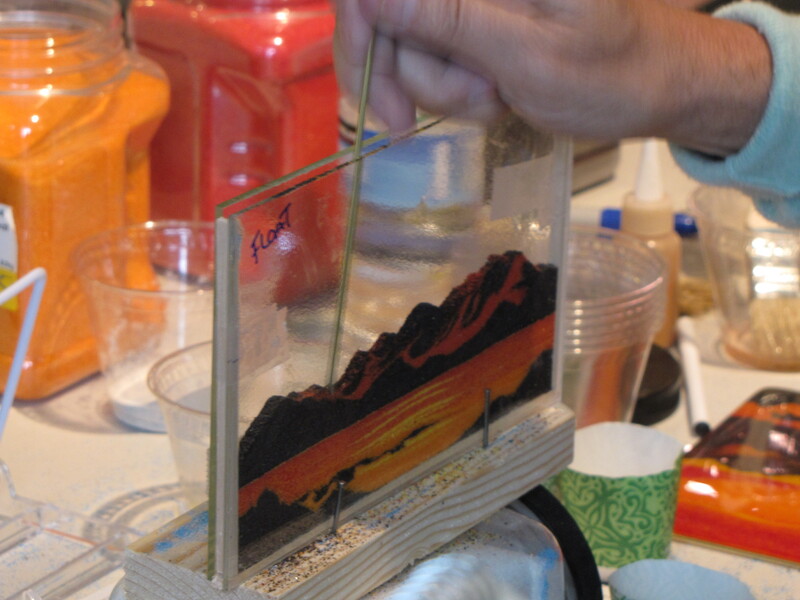 The Glass Art Guild had the pleasure of hosting David Alcala on May 4th and 5 for two one day workshops about Sand Painting with Frit. Guild Member Dana Worley generously shares her photos. Complete commentary and additional photos of Dana (and other members) experience in the workshop can be found on her website: Jester’s Baubles. The purpose of this workshop is to introduce students to the techniques involved in Traditional Glass Painting and the Vitri-Fusáille® process. An emphasis is placed on informing students about which materials and techniques are available, how they are accomplished, and what the potential for their artistic use can be. Experienced glass painters, as well, are encouraged to participate as a way to broaden their own experiences with the medium. DESCRIPTION: Authentic Traditional Glass Painting is a mandatory skill for any glass artist interested in achieving greater visual sophistication in their work. This class offers a comprehensive introduction into the various aspects of genuine glass painting techniques, including the use of traditional glass stainer’s paints, silver stains, and kiln-fired enamels. 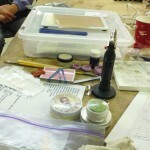 Topics include historical overview of applications and techniques, material types and their sources, with an emphasis on the techniques of tracing, matting, stippling, controlling hardness, application alternatives, studio setup and more. Vitri-Fusáille® is a new glass term which describes the combined processes of flat glass Fusing and Traditional Glass Painting. It is characterized by a degree of expressive, color saturated, illustrational imagery which cannot be found in other glass formats which utilize these processes. Vitri-Fusáille® allows the artist an opportunity to create vivid imagery in glass without being confined by the traditional presence of interfering lead lines or fragmented compositions. 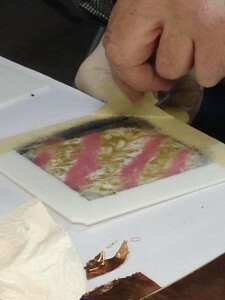 The process involves the creation of specially prepared fused glass tiles which are subsequently enhanced using traditional glass painting techniques. Students begin the process through a series of design strategies which lead to an attainable project plan. Base tiles are then created by fusing a color field layer of System 96 cathedral glass over an underlying substrate of clear System 96 glass. These layers are fused together to form a 1/4” thick tile upon which the painted imagery will be applied. 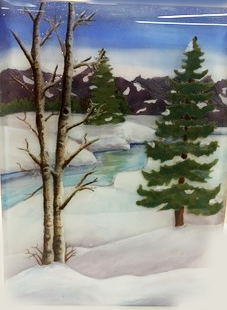 Using a variety of learned traditional glass painting techniques, the final imagery of the art piece is then developed and accomplished with several separate paint applications and kiln firings. Finished tiles can then be framed or integrated into more traditional glass working formats. will, in turn, motivate them to become more artistic with their glass interest. Host suppliers, retailers and teachers will discover that this workshop is a great way to increase their sales by cultivating interest and a demand for the related supplies and workshops. 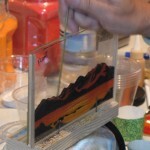 There will be lots of “hands-on” projects focusing on developing new ideas and designs with techniques and methods learned in the class. 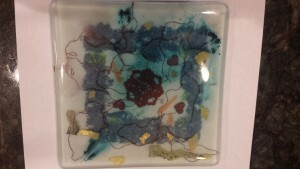 We will explore techniques to create depth and surface design elements using frits, powders, stringers, powder wafers, metals, mica powders, iridized and dichroic glass. Several techniques in kiln casting glass such as positive and negative image casting and lost wax will be taught. 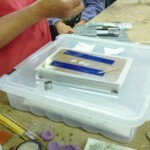 Students will be shown how to use a kiln to melt glass bricks or billets over the top of a refractory plaster model in a manner that will leave an image in relief in the back of the glass. Also this class will teach how to recreate either found objects or other art objects in glass by using glass of various forms. In this two-day workshop students will explore the fundamentals of different ways of kiln casting glass in a solid and three dimensional way. No previous kiln casting experience is necessary. Several techniques in kiln casting glass such as positive and negative image casting and lost wax will be taught. 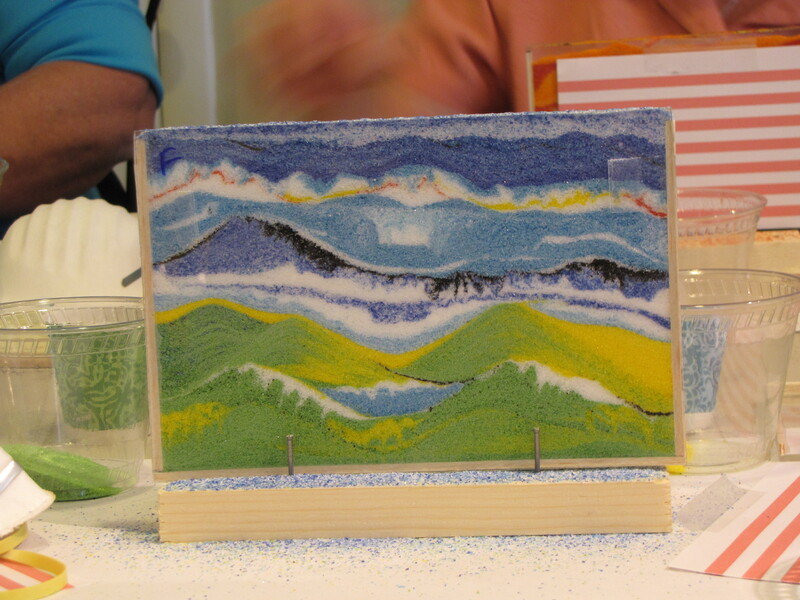 Students will be shown how to use a kiln to melt glass bricks or billets over the top of a refractory plaster model in a manner that will leave an image in relief in the back of the glass. Also this class will teach how to recreate either found objects or other art objects in glass by using glass of various forms. This as a Glass Art Guild of Utah sponsored class and Guild members will receive $100 discount off the regular $300 cost for this class. There will also be a $25 material fee due at the beginning of class. A $100 deposit is required to save your spot in the class and is due by August 15, 2010. Deposits can be mailed or dropped of at Spectrum Studios 196 W. Malvern Ave. Salt Lake City UT 84115. 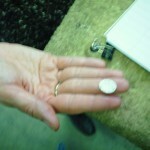 Make checks payable to Glass Art Guild of Utah. 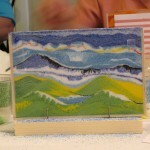 Glass Art Guild of Utah have put together another fantastic glass forming workshop. This time we’re making and pulling cane from the glory hole for making bracelets, beads, paper weights, pattern bars, hot parts or other components to use as a design element in other work or for fusing them together all by themselves either way making and pulling cane is a fun and exciting activity. It’s a great exercise in handling molten glass and will teach you ways of creating glass cane and pattern bars with much detail enabling you to put your own unique style into your fused, cast or lamped worked glass. Several ways of making cane and pattern bars using the glory hole will be taught. Some of these techniques will include gathering molten glass with a punty rod then combining that glass with glass strips, stinger, frits, powder or rods. After working that glob of glass in the glory hole to a soft and pliable state it is then pulled out into a long thin cane. Also a process of building a pattern design in a square glass box that in turn is heated in the glory hole and pulled into a thin cane maintaining the detailed design work of the original box throughout the cane. Each student will have ample time to create their own work. The crucible kiln will be fired up as well to give us a large supply of molten glass to gather from. 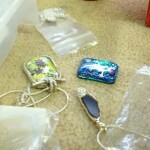 If you are not familiar with working with glass in this way don’t worry no previous experience is necessary. We will take you from start to finish and show you all you need to know to create incredible work. In this 2-day class the first day will be spent on the fundamentals of working with the equipment, making lattacino canes and creating canes for use the following day in more detailed and complex cane and pattern bar pieces. Students of the class will also have an opportunity to rent time on the equipment outside of the time spent in the class. Cost is $150.00 per student and even though all materials are included (in 90 COE) students are encouraged to bring any special colors they would like to use. Anyone wanting to use anything other than 90 COE glass are welcome to bring their own glass. Please contact Stacy to sign up. We will need a deposit of $75.00 before the 5th of March to hold your spot. Also, there are only 10 spots available so get your name on the list if you are interested! Fifty percent non-refundable deposit due on July 1st.